Cauliflower, once a lowly, plain vegetable sometimes boiled or used as a crudité with dip is now the “darling” of food lovers. It is especially suited to vegan cooking because of the versatile way in which it can be transformed into a wide variety of delicious non-meat choices. Originally grown in the Isle of Cyprus, cauliflower has been cultivated in North America for over 300 years. Cauliflower is a nutrition powerhouse. A member of the “cole” family, it is related to cabbage, Brussel sprouts, and kale. It is known for both its fibre content and rich nutrients. 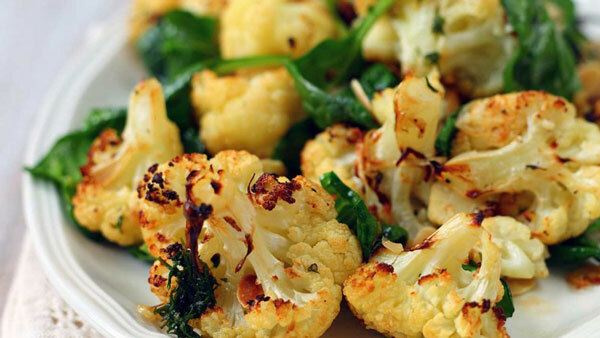 The antioxidants in cauliflower help protect cells from damage that leads to chronic illness. Magnesium content assists with muscle contraction and cognition. The folate and vitamin B6 in cauliflower keep your nervous system healthy. Purple and orange cauliflowers are real! Purple cauliflower gets its colour from the presence of the antioxidant anthocyanin, also found in red cabbage and red wine. Orange cauliflower (introduced in Canada in 19970) gets its colour from beta carotene. 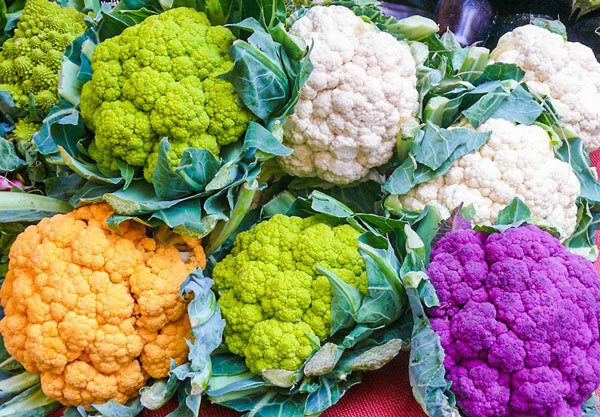 Both varieties contain about 25% more vitamin A than white cauliflower. Apart from steaming the florets, cauliflower can be roasted, riced or mashed, and then made into various treats. Greek yogurt or cream cheese, or serve with a drizzle of olive oil and a sprinkling of parmesan cheese. Riced cauliflower: Ground, uncooked cauliflower can be used as a substitute or addition to white rice. It’s a great way to get more vegetables into one’s diet! Riced cauliflower can also be used for fried “rice” dishes. Shaved Cauliflower Salad: Thinly sliced raw can be tossed alone or mixed in with your favourite coleslaw. Add to Pasta: When making macaroni and cheese, add a cup of ground cauliflower. No one will notice except for the boost of nutrition! Add ground cauliflower to your favourite pasta dish. Makes a great addition to “Alfredo” sauce. Make a dip: Make a “hummus” dip substitute by mixing together cooked, mashed cauliflower with tahini, olive oil, lemon juice, salt and pepper. USe as a fish substitute: Roll each floret in beaten egg, and dip in bread crumbs with salt, pepper and paprika. Now roast on an oiled sheet in the oven until the outside is crispy brown. Serve as the “fish” in fish tacos. Pizza: Cauliflower has become a popular way to make pizza crust for those on gluten free diets. Check your grocery store or check online for various easy recipes that use a mixture of egg, ground cauliflower and cheese.